When I was young, I was a seasoned concert goer. I went with my parents as a child and with my friends as a teenager. Of course, this meant that sometimes I didn’t have a say in whether or not I was going, and in other situations peer pressure kept me from saying no. By the time I hit my early twenties, I was done with concerts. They were too loud, too crowded, and I just didn’t enjoy them anymore. I saw Styx, REO Speedwagon, and Def Leppard in 2008 with a friend, then went on a nine-and-a-half-year concert-less streak. 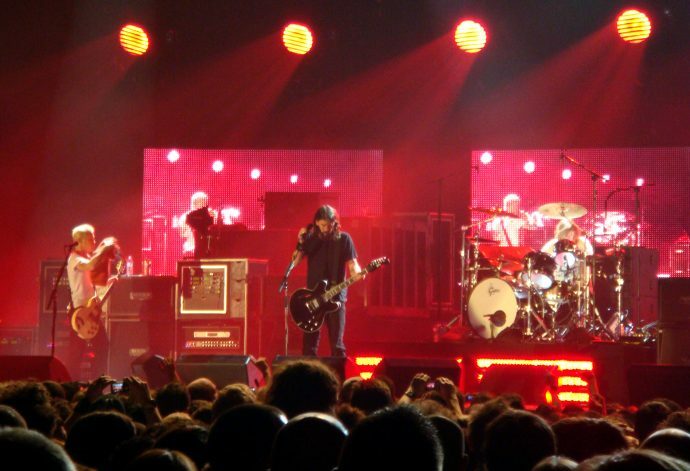 On December 7, 2017, the Foo Fighters came to town. Now, there aren’t a lot of things that will convince me to climb out of my introvert hamster ball, but this… this was a major exception. You see, my top three favorite bands/musicians are the Beatles, David Bowie, and the Foo Fighters. For obvious reasons, I’m never going to be able to see the Beatles or Bowie — so there was no way in hell I was going to miss my chance to see the Foo Fighters. I went, had a blast, and got so emotional that I actually cried. It was perfect, and I’ll treasure the memory for the rest of my life. Yes, this highly sensitive introvert loved a rock concert. I know it sounds weird, but that’s only because there’s a misconception floating around that introverts don’t ever like to go out and “do things.” That’s not what it means to be an introvert at all. While it’s true that you’re more likely to find your average introvert relaxing at home on a weekend, it doesn’t mean that’s all we do. The world has a lot of awesome stuff to offer, and we may be just as excited about it as our extroverted counterparts — we just need more time to recharge after enjoying said awesome stuff. When it comes to concerts, there are a few things you can do to make the experience a little easier to take in. 1. Choose a section close to the exit. Many introverts feel physically uncomfortable when surrounded by a crowd — we’d rather be anywhere than in a sea of people. When ordering your ticket, choose a seat as close to the aisles and exits as possible. If it’s an event where there are no assigned seats, sit or stand near the periphery of the crowd. This will allow you to leave without difficulty when you’re ready. 2. Go with friends who energize you, not drain you. As with parties and other large events, it’s always nice to have a close friend or two you can talk to when going to a concert. Our aversion to small talk and strangers make us feel incredibly vulnerable when we’re surrounded on all sides by the unfamiliar, so having people nearby who energize you is important. Make sure it’s someone who understands your introversion, won’t leave you on your own, and won’t be upset if you duck out early. The noise, the smells, the crushing crowd — it can all be a bit overstimulating to an introvert. If you’re starting to feel overwhelmed and exhausted (rather than excited and engaged) it’s time to go. According to introvert best practices, it’s best to take separate vehicles so you can leave early if the need arises. You don’t want to end up stuck at the concert, miserable and overstimulated. One way to avoid overstimulation is to pop in some earplugs. It’s also good for your hearing! Extended exposure to music over 85 decibels can cause hearing loss. Since concerts can be around 115 decibels or more (depending where you’re standing), earplugs will not only help you skirt overstimulation but can also keep you from ending up with tinnitus. 5. Skip the opening act. Unless the opening band is someone you absolutely have to see, skipping them is a great way to ensure you don’t become overwhelmed and leave before the band you came to see is done playing. If I’d left before the encore, I would have missed “Everlong,” and that’s a heartbreaking thought. To figure out when the concert will actually start, consider the following: Opening acts usually play for 30-45 minutes, then there’s a 15-30 minute changeover before the headliner takes the stage. However, these are estimations and can vary depending on the bands playing and the venue. Being an introvert (and/or highly sensitive) doesn’t mean you can’t enjoy a wickedly awesome rock concert in a packed stadium. It just means you have to take certain precautions in order to avoid breaking your brain. As with all crowded events, it’s something you’ll want to take a few weeks to mentally prepare for. It’s also a good idea to schedule downtime immediately following the concert. And, for most introverts, large concerts aren’t something you want to go to every week. Instead, spread them out over time and give yourself plenty of leeway. Knowing my introverted nature, I had the foresight to take quite a few protective measures before heading out to the big show. As such, I thoroughly enjoyed myself and made memories that will last a lifetime. Of course, a lot of credit goes to the band for being incredible, but still, I need to give myself (and my friends) props for working hard to make the experience enjoyable from one end to the other.